I know that these pics scroll automatically up in the top-right corner but I decided to devote a post to them with stats. 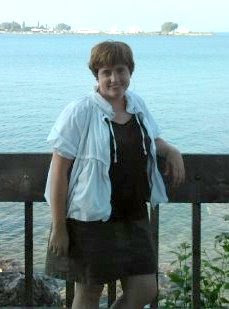 On vacation in Michigan, last week of August, 2009. Probably weighed about 180, was a snug size 16. Easter Sunday 4/4/2010 - not sure about weight but I think the skirt is a size 14. 8/15/10 - 148lbs - size 10! 12/12/10 - about 145lbs - lost enough in my calves to get back into my black boots! So, that's me so far. Still a ways to go but very happy with the progress thus far. You look awesome! I got excited about fitting into boots again, too. Congratulations! You look great! Congratulations on your success! As someone who used to shop in the "husky" section, I know it's not easy. Just remember your journey begins when you decide to make that first step and it ends when you are comfortable with you. Best wishes! WOW! I am both happy for you and INSANELY jealous! You look incredible!